Methods and systems for generating media item recommendations are disclosed herein. According to an aspect, a method may include using at least a processor and memory for receiving candidate media items associated with one or more computing devices that either has recently played or is currently playing a media item currently being played by another computing device. The method may also include determining recommendation scores for the candidate media items based on occurrence counts of the media items within a predetermined time period. Further, the method may include generating a media item recommendation for the other computing device based on the recommendation scores. RECOM MENDATIONS IN A M EDIA RECOM MENDATION SYSTEM, all of which are hereby incorporated herein by reference in their entireties. The present disclosure relates to playback of media items. Particularly, the present disclosure relates to generating recommendations for playback of media items. Playing media items using network connected computing devices has gained popularity in today's society. Internet-based music service providers, such as Last.fm Ltd. and Spotify Ltd., have popularized the practice of providing real-time playback status information of users to a central server, centra! system, or other computing device. The service may then analyze the information and use it for recommending music to other users. Currently-available music recommendation systems have made use of co- occurrence information within media sets to develop high-quality recommendation systems. Example systems include Apple Inc.'s ITUNES* GENIUS* service, and before that Strands, Inc.'s media recommender service. Using the ITUNES* GENIUS* service as an example, a central system collects information about the media collections of multiple users, and the service has access to a large and rich data set. The system then proceeds to analyze each user collection, and counts each time two media items occur within each collection. When analyzed over a large number of collections, information is produced that indicates the likelihood of a second media item being present, given the presence of a first media item. This relationship may also be referred to as the affinity between the two items. An enhancement to this algorithm includes assigning a higher bond between two media items occurring within a user created playlist within a collection, versus just occurring within the same collection. Basically, if two items occur within the same collection, it may be reasoned that they are related in some way (i.e., the same user likes both media items enough to own them). Likewise, if a user went through the effort of creating a custom playlist containing two media items, then they must be highly related. It is desired to provide improved techniques and systems for generating music recommendations. Disclosed herein are methods and systems for generating media item recommendations. According to an aspect, a method may include using at least a processor and memory of a computing device for obtaining play schedules associated with a plurality of other computing devices, the other computing devices currently playing or having recently played a reference media item. From the play schedules, candidate media items are chosen. Candidate media items may be a smaller group of media items that can be selected for recommendation to a user. The method may also include determining recommendation scores for the candidate media items. Further, the method may include generating a media item recommendation for one or more other computing device based on the recommendation scores. As used herein, the term "playhead" is used to indicate the play position of a user of a computing device on a position scrollbar, The playhead may be represented through graphics, text, or any combination thereof. The playhead may contain other information about the user of the computing device including profile information comprising gender, geographic location, geographic proximity, group affiliations, demographics, age, influence rating, appearance history, favorite artist, favorite song, favorite entertainer, computing device type, play state status, and the like. The playhead may also display information relating to the play schedule of the user corresponding to the computing device, the play schedule comprising future media items to be played and past media items played. According to another aspect, a method of determining a list of playheads for a media item may include using at least a processor and memory at a computing device for playing a media item. The method may include determining a plurality of other computing devices that are currently playing the same media item. Further, the method may include determining a plurality of intervals for display of playheads corresponding to the other computing devices on a playhead scrollbar. The method may also include selecting an optimal other computing device for at least one of the plurality of intervals. Further, the method may include displaying a playhead corresponding to the optimal other computing device on the playhead scrollbar. According to yet another aspect, a method includes using at least a processor and memory for obtaining a play instance identifying a media item and a corresponding timestamp indicating when the media item was played. The method also includes associating the play instance with a plurality of play instances associated with the media item. In response to determining that an update criteria has been satisfied the method further includes executing an update function to determine updated media item recommendations. The method also includes storing the updated media item recommendations in a recommendation list for future use. FIG. 20 is a block diagram of a central system in accordance with embodiments of the present disclosure. The presently disclosed subject matter is described with specificity to meet statutory requirements. However, the description itself is not intended to limit the scope of this patent. Rather, the inventor has contemplated that the claimed subject matter might also be embodied in other ways, to include different steps or elements similar to the ones described in this document, in conjunction with other present or future technologies. Moreover, although the term "step" may be used herein to connote different aspects of methods employed, the term should not be interpreted as implying any particular order among or between various steps herein disclosed unless and except when the order of individual steps is explicitly described. As referred to herein, the term "computing device" should be broadly construed. It can include any type of mobile device, for example, a smart phone, a cell phone, a pager, a personal digital assistant (PDA, e.g., with GPRS NIC), a mobile computer with a smart phone client, a portable media player device, a mobile gaming device, a tablet computer, a handheld computer, a laptop computer, set-top box, Internet radio, A/V network receiver, or the like. A computing device can also include any type of conventional computer, for example, a desktop computer or a laptop computer. A typical mobile device is a wireless data access-enabled device (e.g., an iPHONE* smart phone, a BLACKBERRY* smart phone, a N EXUS ON E™ smart phone, an iPAD™ device, Samsung Rogue smart phone, or the like) that is capable of sending and receiving data in a wireless manner using protocols like the Internet Protocol, or I P, and the wireless application protocol, or WAP. This allows users to access information via wireless devices, such as smart phones, mobile phones, pagers, two-way radios, communicators, and the like. Wireless data access is supported by many wireless networks, including, but not limited to, CDPD, CDMA, GSM, PDC, PHS, TDM A, FLEX, ReFLEX, iDEN, TETRA, DECT, DataTAC, Mobitex, EDGE and other 2G, 3G, 4G and LTE technologies, and it operates with many handheld device operating systems, such as PalmOS, EPOC, Windows CE, FLEXOS, OS/9, JavaOS, iOS and Android. Typically, these devices use graphical displays and can access the I nternet (or other communications network) on so-called mini- or micro-browsers, which are web browsers with small file sizes that can accommodate the reduced memory constraints of wireless networks. In a representative embodiment, the mobile device is a cellular telephone or smart phone that operates over GPRS (General Packet Radio Services), which is a data technology for GSM networks. In addition to a conventional voice communication, a given mobile device can communicate with another such device via many different types of message transfer techniques, including SMS (short message service), enhanced SMS (EMS), multi-media message (MMS), email WAP, paging, or other known or later-developed wireless data formats. Although many of the examples provided herein are implemented on a mobile device, the examples may similarly be implemented on any suitable computing device. As referred to herein, an "interface" is generally a system by which users interact with a computing device. An interface can include an input for allowing users to manipulate a computing device, and can include an output for allowing the system to present information and/or data, indicate the effects of the user's manipulation, etc. An example of an interface on a computing device (e.g., a mobile device) includes a graphical user interface (GUI) that allows a user to interact with programs in more ways than typing. A GUI typically can offer display objects, and visual indicators, as opposed to text-based interfaces, typed command labels or text navigation to represent information and actions available to a user. For example, an interface can be a display window or display object, which is selectable by a user of a mobile device for interaction. The display object can be displayed on a display screen of a mobile device and can be selected by and interacted with by a user using the interface. In an example, the display of the mobile device can be a touch screen, which can display the display icon. The user can depress the area of the display screen at which the display icon is displayed for selecting the display icon. In another example, the user can use any other suitable interface of a mobile device, such as a keypad, to select the display icon or display object. For example, the user can use a track ball or arrow keys for moving a cursor to highlight and select the display object. transmission functionality comprises one or more components such as a mobile switching center (MSC) (an enhanced ISDN switch that is responsible for call handling of mobile subscribers), a visitor location register (VLR) (an intelligent database that stores on a temporary basis data required to handle calls set up or received by mobile devices registered with the VLR), a home location register (HLR) (an intelligent database responsible for management of each subscriber's records), one or more base stations (which provide radio coverage with a cell), a base station controller (BSC) (a switch that acts as a local concentrator of traffic and provides local switching to effect handover between base stations), and a packet control unit (PCU) (a device that separates data traffic coming from a mobile device). The HLR also controls certain services associated with incoming calls. Of course, the present disclosure may be implemented in other and next- generation mobile networks and devices as well. The mobile device is the physical equipment used by the end user, typically a subscriber to the wireless network. Typically, a mobile device is a 2.5G-compliant device or 3G-compliant device (or 4G-compliant device) that includes a subscriber identity module (SIM), which is a smart card that carries subscriber-specific information, mobile equipment (e.g., radio and associated signal processing devices), a user interface (or a man- machine interface (MMI), and one or more interfaces to external devices (e.g., computers, PDAs, and the like). The mobile device may also include a memory or data store. The presently disclosed subject matter is now described in more detail. FIG. 1 illustrates a block diagram of an exemplary computing environment for generating media item recommendations in accordance with embodiments of the present disclosure. Referring to FIG. 1, a central system 100 may be communicatively connected to computing devices 50 (i.e., computing devices 50-1, 50-2, 50-3 ... 50-N) via one or more networks 20. The central system 100 may include a control system 102 having a user information broker 104, a tracker information broker 106, and a media broker 108. The user information broker 104 may manage and store data relating to users of the central system 100. For example, the user information broker 104 may store such data in a user accounts database 200. Users may include, but are not limited to, persons who are operating the computing device 50 or who have previously operated the computing device 50. The tracker information broker 106 may maintain tracker information 400 describing a currently playing media item and a current position within the media item. The tracker information 400 may be stored on a server, such as central system 100 shown in FIG. 1, or another computing device, such as one of computing devices 50 shown in FIG. 1. The media broker 108 may be operable with a media repository 300 and may provide access to media items playable within the computing environment. A media item may be, for example, but not limited to, audio (e.g., music), video, or any combination thereof. The functions of the central system 100 may be implemented in software, in hardware, in firmware, or in any combination thereof. The central system 100 may be implemented as a single server, or any number of computers or servers comprising a server farm. The server(s) and/or computer(s) of the central system 100 may be located either at the same network location or at various different network locations distributed throughout the network(s) 20. A user may interact with the central system 100 by use of one of the computing devices 50. In an example, a computing device 50 may communicate with the central system 100 using the Internet, any other suitable communications network, or combinations thereof. registration/login/authentication (RLA) function 52-1, a media playback function 54-1, a user interface (Ul) handler 60-1, an interface 55-1, and a data store (or memory) 57-1. Computing devices 50-2, 50-3 ... 50-N may include the same or similar functions having the same or similar features. The RLA function 52-1 may control the interface (e.g., a display) 55-1 for allowing the user to register with the central system 100 and to create a user account for storage in the user accounts database 200. In an example, information regarding users may be obtained from or augmented with data obtained from a social network or from other computing devices, such as computing devices 50-2 and 50-3. As used herein, the term "social network" may be used to describe any system operating to provide a user of the system the ability to express reciprocal friend relationships with other users of the system. An example of a social network is any of the social networks maintained by the FACEBOOK* social network service. As used herein, the term "social distance" may be used to describe the number of hops required to reach another user of the system. For example, a friend can have a social distance of one. A friend of a friend can have a social distance of two. relationships possessed by a single user. External services, such as services described in this disclosure, may obtain information regarding a user of a social network using an application programming interface (API) for external developers. In the example of the FACEBOOK* social network service, this external API is called Facebook Connect. The media playback function 54-1 may operate to provide playback of a media item. The media playback function 54-1 may communicate to the central system 100 information specifying a currently playing media item and a current playback position within the media item. For example, the media playback function 54-1 may control an input/output component of the computing device 50-1 to communicate to a state tracking function 56-1 a media item identifier (ID) and an identifier of the current playback position of the media item. The media playback function 54-1 may periodically communicate such state information to the state tracking function 56-1 for storage within the tracker information database 400. The state tracking function 56-1 may also update information within the tracker information database 400. Further, the state tracking function 56-1 may communicate to the computing device 51-1 similar user state information obtained from other computing devices 50. For example, such state information may be obtained from other computing devices, such as computing device 50-2 or 50-3, currently playing media items having the same media item ID as the requesting computing device 50-1 along with the corresponding user state information for each respective computing device 50. A next media item selection function 58 may include logic for selecting a next media item for playback. In an example, the logic of the next media item selection function 58 is executed at the central system 100, and the results are provided to a computing device 50. Those of ordinary skill in the art will appreciate that the network(s) 20 is not limited by the aspects listed above. More specifically, the network(s) 20 may be one or more of any type of network suitable to allow interaction between the computing devices 50 and the central system 100. For example, the network(s) 20 may be a wired network, a wireless network, or any combination thereof. Further, the network(s) 20 may include a distributed computing network, an intranet, a local-area network (LAN) and/or a wide-area network (WAN), or any combination thereof. FIG. 2A illustrates a block diagram of an example structure of a user accounts database 200 in accordance with embodiments of the present disclosure. The user accounts database 200 may be stored on a server, such as central system 100 shown in FIG. 1, or another computing device, such as one of computing devices 50 shown in FIG. 1. Referring to FIG. 2A, the user accounts database 200 may include information associated with users of the computing environment depicted in FIG. 1. A play history field 202 may include information identifying media items being played by a respective user. For example, information contained in the play history field 202 may identify the title, type, and timestamp of time played of the media item. An appearance history field 204 may include information identifying occurrences where the respective user 10 appeared as another user on a position scrollbar (e.g., described with respect to the example of FIG. 4A). This information may also contain a user ID of the user whose position scrollbar (e.g., described with respect to the example of FIG. 4A) included the user, a timestamp of the occurrence, and an indication of whether the user was followed. A friends list field 206 may include one or more identifiers for identifying other users of the system with which the user has a relationship. In an example, a friend may be another user with which the user successfully completed an invitation response protocol within a social network environment. Further, the friends list may include identifiers of computing devices of the other users. A preferences field 208 may include information about preferences of the user. The preferences information may be used for various customizations pertaining to the operation of the disclosed systems and methods. Examples of preferences may include display colors, display fonts, startup preferences, media item genre, evaluation interval settings, and/or the like. A profile information field 210 may include information regarding the user. This information may include age, gender, birthday, demographic information, race, ethnicity, political affiliation, clubs, awards, and/or the like. A location field 212 may include information indicating the location of user 10. In an example, this field may include identification of the last known location of the user. In another example, this field may include a history of locations and timestamps. An access information field 214 may include information representing which other users and applications may make use of various stored information regarding the user. For example, the user may choose to make all his/her information public, grant access only to friends, only to certain friends or list of users, and/or the like. A user state field 230 may include information representing an activity of a user currently playing back a media item. For example, user state information may include an identifier uniquely identifying a computing device within the system. In another example, user state information may include an identifier identifying a user within the system. Further, for example, user state information may include media item schedule information and/or other information as disclosed herein regarding a user's state. As used herein, the term "state query" is used to refer to a process of a computing device transmitting a user's identification information and currently playing media item identifier to a central system or other computing device. In response, the central system may transmit to the computing device a list of other users currently playing the same media item, along with the corresponding next media item to play information for each other user. FIG. 2B illustrates a block diagram of an example structure of a user state field 230 in accordance with embodiments of the present disclosure. The user accounts database 200 may be stored on a server, such as central system 100 shown in FIG. 1, or another computing device, such as one of computing devices 50 shown in FIG. 1. Referring to FIG. 2B, the user state field 230 may include information representing the activity of users currently playing back a media item corresponding to a media item ID. The user state field 230 includes a computing device ID 232 which is an identifier uniquely identifying a computing device, such as computing device 50-1. In an example, the computing device ID 232 is a MAC address of the computing device, such as computing device 50-1. Further, the user state field 230 includes a user ID 234 which is a unique identifier identifying a user. In an example, the user ID 234 may be a username or login for the user within a social network. A current position 236 may indicate the playback position of the user within the media item associated with the media item ID. A play state 238 may indicate the current state of playback of the media item associated with the media item ID. Examples of play state 238 may include paused, stopped, playing, forwarding, reversing, and the like. A media item schedule 250 may include past media items 252. The past media items 252 may contain a previous media item field 253 including information identifying the media item that was previously played by the user. Current media item 254 may contain information identifying the media item currently being played by the user. Future media items 256 may indicate one or more next items to be played by the corresponding user. Next media item 255 may identify the media item ID that will be played for the user at the end of the current media item 254. This information may also include the user(s) that were playing the same media item ID and contributed to its selection. A last evaluation time may represent the last time that the logic was successfully executed to determine the next media item 255 to play. Reasons for failure might include network failure, network latency, user starvation (e.g., instance where a user is denied a resource), and the like. Playback scrollbar information 240 may include next evaluation time 242, which may represent the scheduled time when the next media item 255 determination logic will be executed. Last evaluation time 244 may represent a scheduled time when the previous media item 253 was executed. Evaluation interval 246 may represent the interval between next media item selection attempts. This may be expressed in terms of a time interval, a divisor by which a duration 247 of the media item ID is divided to arrive at the evaluation interval 246. In an example, the next media item 255 determination is performed only twice: once at the start of the media item, and again later in the playback of the media item. Playback scrollbar information 240 may also include other playheads 248. A playhead may be an indicator of a current play position within a media item. For example, a playhead may be a displayed icon or line that indicates a relative position of play within some other indicia (e.g., a displayed bar) of the total play time of a media item. FIG. 3 illustrates a block diagram of an example structure of a media repository 300 in accordance with embodiments of the present disclosure. The media repository 300 may be stored on a server, such as central system 100 shown in FIG. 1, or another computing device. Referring to FIG. 3, the media repository 300 may store data operated on by a media broker, such as the media broker 108 shown in FIG. 1. The media repository 300 may include one or more media items 310 (e.g., media items 310-1, 310-2, 310-3...310-N). Each media item 310 may include a media item ID 30 (e.g., media item ID 30-1), metadata 312 (e.g., metadata 312-1) describing the item, a duration 314 (e.g., duration 314-1) of the media item, source URLs 316 (e.g., source URLs 316-1), and type 318. The media item ID 30-1 may be an identifier uniquely identifying the media item within the system. The metadata 312-1 field may contain information about the media item such as, for example, title, artist, producer, year of release, studio, performers, and/or the like. The duration 314-1 is the time duration in seconds of the media item. The source Uniform Resource Locators (URLs) contain information identifying the location of the media item. Type 318-1 may indicate the data type of the media item. Example media items include audio, video, or any combination of audio and video. The source of the media may be a media repository controlled by the media broker 108, media stored at the device, user media stored in the cloud and made available to the computing devices, subscription services, or any combination of these sources. The media broker 108 may provide an identification and translation function whereby the same media item may be correctly identified throughout the system. information in the tracker information 400. The structure may include multiple tracker items 410, such as tracker items 410-1, 410-2, 410-3 ... 410-N. Each tracker item 410 may correspond to a media item and may include a media item ID, such as media item ID 30-1. Further, each tracker item 400 may include a play history 430, such as play history 430-1, and a recommendation list 460, such as recommendation list 460-1. FIG. 4B illustrates a block diagram of example structures of play histories 430-1, 430-2 ... 430-N in accordance with embodiments of the present disclosure. Referring to Fig. 4B, the play history 430-1 may include a count 432-1 and one or more play instances 450-1 ... 450-N. Each play history 430 may correspond to an instance in which a media item was played by a user 10. The play instance may include a timestamp 12 indicating a play time and a geographic location 14 at which the media item associated with the media item ID 30 was consumed. A media item may be treated as played by the system in a number of different manners. For example, the play instance may indicate that play of the media item started, that a percentage of the content of the media item was played, and/or that the entirety of the media item was played. The timestamp may be assigned by the computing device playing the media item, or it may be assigned at a central system or other computing device. The most recently played media items are represented at the top, and the least recently played media items are represented at the bottom. recommendation list elements 466-1, 466-2 ... 466-N). Last evaluation 462 may store information indicating the time when the last recomputation of the recommendation list elements 466 occurred. Usage count 464 may indicate how many times the recommendation list elements 466 have been accessed. List count 465 may indicate the number of media items 30 (e.g. media items 30-1, 30-2 ... 30-N) present in the recommendation list elements 466. FIGs. 5A and 5B illustrate screen displays of user interfaces 500 and 550, respectively, of a social media player in accordance with embodiments of the present disclosure. The user interface shown in FIG. 5A is configured for playing back a song. The user interface shown in FIG. 5B is configured for playing video. Referring to FIG. 5A, the user interface 500 includes a user information pane 502, a media pane 504, and a current song position scrollbar 532. The current song position scrollbar 532 includes social playheads 520 (e.g., playheads 520-1, 520-2, 520-3, and 520-4) for other users currently playing the same media item. The current song position scrollbar 532 contains one social playhead for the user of the application 520-3, one or more trailing playheads 520-1 520-2, and one or more leading playheads 520-4. The playheads 520 may each include media item schedules (e.g., schedule 534) indicating the next songs to be played for the respective playhead. A number may be displayed within box 570 for indicating a number of playheads that are displayed. The selector adjacent box 570 may be used for changing the number of playheads to display on the scrollbar 532. The user pane 502 may operate to display a hierarchical information menu wherein the top level menu items of the hierarchical information menu corresponds to the social playheads 520 currently appearing on the position scroll bar 532. In this particular figure, only menu 508-1 is in an expanded state. Menu items 508-2, 508-3, 508-4, 510, 512, 514, 516, and 518 are all in their contracted states. The social playhead menu items 508 may include the social playhead 540 and position indicator 542. Selection of a menu item (e.g., media items 508-1, 508- 2, 508-3, and 508-N) may cause additional information regarding the user to be displayed. The additional information displayed may include play history information 510, favorite track information 512, favorite artist information 514, follower information 516, and followee information 518. Selection of the play history information 510 menu item may effect the presentation of information stored in the play history 202 field of a user account database, such as the user account database 200 shown in FIG. 2A. The information displayed by the favorite tracks information 512 menu item and the favorite artist information 514 menu item may be determined from an analysis of the play history 202. The information displayed in the followers information 516 menu item and followee information 518 menu item may be stored in a friends list 206, such as the friends list 206 shown in FIG. 2A. The media player pane 504 may include a media information area 507 and the position scrollbar 532. The media information area 507 may also include a cover art display area 506 and a hierarchical information menu wherein the top level menu items of the hierarchical information menu corresponds to metadata for the currently playing media item 254. An artist information 524 menu item may operate to display information about the artist of the currently playing song. The album information menu item 526 may display information regarding the album from which the current song is playing, as well as other tracks 529 from the same album. Information describing other albums 530 from the same artist may also be displayed. In accordance with embodiments of the present disclosure, a next song to play for a user may be determined by selecting the most frequently occurring next song from among other users. This determination may be made at any time before the user reaches the end of playback of the current media item. This determination process may occur only once, or it may occur multiple times. Those of ordinary skill in the art will recognize that many variations are possible in terms of algorithms for selecting a next media item to play. These variations should be considered within the scope of the present disclosure. In an example, the media player pane may show, by default, information related to the currently playing media item. Alternatively, this information may not be shown by default. The user may select other media items for which to display information by selecting any song appearing in any upcoming media item list of any other user. In an example, the information shown in the song information pane 506 may include album art and metadata relating to the song. Unless otherwise configured, the media item described in the media player information pane may revert back to a current media item at the start of each new media item. The media pane 504 may display information for a selected user. The selected user may be the current user, or any user displayed as a playhead. As the user selects a playhead 520 by clicking on it or using other such selection means, the media pane 504 may update to display information for that specific user. In an example, the information shown in the media pane 504 can be comprised of the user's profile image and metadata relating to the user. Referring to FIG. 5B, the user interface 550 includes the user information pane 502, the media pane 504, and the current video position scrollbar 532. The current video position scrollbar 532 includes social playheads 520 (e.g., playheads 520-1, 520-2, 520-3, and 520-4) for other users currently playing the same video. The user information pane 502 may operate to display a hierarchical information menu wherein the top level menu items of the hierarchical information menu corresponds to time periods 554 (e.g., time periods 554-1, 554-2, 554-3, and 554-4) of a video 552 being played back. Menus 554 and 508 are hierarchical controls operable to show additional information in an expanded view when selected. In this particular figure, only menu 554-3 is in an expanded state. Menu items 554-1, 554-2, 554-4, and 508 are all in their contracted states. A user may interact with the display to select one of the time periods 554 to uncover a corresponding next level of menu items 508 (e.g., media items 508-1, 508-2, 508-3, and 508-4). The menu items 508 may correspond to other users who are at a position within the selected time period within the video 552. Selection of a menu item 508 may cause additional information regarding the user 520 to be displayed. The additional information displayed may indicate a time where the respective user is in playback of the video along with a thumbnail image 556 (e.g., images 556-1, 556-2, 556-3, and 556-4) corresponding to that position in the video 552. A number may be displayed within box 572 for indicating a number of playheads that are displayed. The selector adjacent box 572 may be used for changing the number of playheads to display on the scrollbar 532. Further, a number may be displayed within box 574 for indicating a number of divisions displayed within the scrollbar 532. The selector adjacent box 574 may be used for changing the number of divisions. FIG. 6A illustrates a graphical representation of an example media item schedule of multiple users on a position scrollbar 532 in accordance with embodiments of the present disclosure. More particularly, FIG. 6A depicts an expanded view of the position of users with respect to the scrollbar 532 currently playing the same song. In this figure, the position scrollbar 532 is shown along with their corresponding media item schedules 250. The media item schedules 250 may include past media items that are generally designated 252, a current media item 254, and next media items 256. In this example, there are four playheads 520 corresponding to four users. Two of the playheads are trailing playheads 520-1 520-2, one of the playheads is a leading playhead 520-4, and one of the playheads is a current playhead 520-3. While only four playheads are shown there may be any number of trailing or leading playheads, but there may be only one current playhead. As a practical matter, there is a limit to how many playheads 520 may be shown on the position scrollbar 532 while remaining intelligible. Trailing playheads 520-1, 520- 2, 520-3, and 520-4 may have corresponding media items. representations of music items played by playheads 520-1, 520-2, 520-3, and 520-4 over a period of time are depicted. Music items are represented, for example, by lettered segments along bars 602, 604, 606, and 608 for playheads 520-1, 520-2, 520-3, and 520-4, respectively. FIG. 6B depicts the example of FIG. 6A from a different perspective in which a user may view the media item that each user has listened to, is listening to, or will be listening to with respect to what each of the other users are doing at the same time. At the current time t = 0, all four users associated with playheads 520-1, 520-2, 520-3, and 520-4 are experiencing the same media item, i.e., listening to song G. At the time t = - 10, trailing playhead 520-1 was finishing song B, the trailing playhead 520-2 was listening to song S, the leading playhead 520-4 was listening to song A, and following playhead 520-3 was listening to song M. In FIGs. 6A and 6B the example shown has the same number of past media items 252 and future media items 256 for each of the leading 520-4 and trailing users 520-1 520-2, but this need not be the case because each user may have differing numbers of past media items 252 and future media items 256. In accordance with embodiments of the present disclosure, a computing device corresponding to playhead 520-3 or a central server may determine one or more media items for playback by the computing device associated with playhead 520-3. For example, the computing device or server may obtain or otherwise receive candidate media items from other users recently playing the currently playing media item of the user associated with playhead 520-3. In the example of FIG. 6B, it may be determined that at time t = 0 or near a time t = 0, playheads 520-1, 520-2, and 520-4 are also playing song G on their respective computing devices. In response to determining that the other playheads are playing the same music or other media item, the computing device or server may determine candidate media items from the others. For example, the computing device or server may determine that the others have played music A and B, and music A and B may be candidates for playback by playhead 520-3. Other candidate media items may be, for example, the music that the others will play. Subsequently, the computing device or server may determine a recommendation score for the candidate music based on an occurrence count of the candidate music with an analysis window. For example, the computing device or server may count the number of occurrences (e.g., number of times the candidate music was played) within a predetermined time period. The recommendation score may be based on the occurrence count for the others within the predetermined time period. Subsequently, the computing device or server may select for playback one or more music items from the group of candidate music based on the recommendation score. For example, the computing device or server may select for playback the music with the highest number of occurrences within the predetermined time period. This music may be set for playback by the computing device associated with playhead 520-3 within a time period (designated by broken line 616). Referring to FIG. 4C, a media item ID is the unique identifier associated with the media item. Last evaluation is used to track the time at which the recommendations associated with the media item were last computed. Usage count tracks the number of times that the recommendation list 460 has been accessed. There are two parts to the usage count. One counter counts the total number of times the recommendation list 460 has been accessed. recommendation list 460 is maintained in the file store or database. FIG. 7A illustrates a diagram depicting example timing of state queries in accordance with embodiments of the present disclosure. Referring to FIG. 7A, state queries 702 (e.g., state queries 702-1, 702-2, 702-3, 702-4 ... 702-N) may be attempted on a periodic basis based on dividing a duration (e.g., as indicated by duration 247 shown in FIG. 2B) of a media item ID by an evaluation interval, such as evaluation interval 246 shown in FIG. 2B. As part of each state query, a computing device may transmit its user state information (e.g., information contained in the user state field 230 shown in FIG. 2B) to a central system (e.g., the central system 100 shown in FIG. 1), and may receive user state information for zero or more other users' current media item (e.g., as indicated by current media item 254 shown in FIG. 2B). The computing device 50 may subsequently determine a next media item (e.g., next media item 255 shown in FIG. 2B). It is noted that selection of a next media item to play does not necessarily include the initiation of the playback of the next media item. Without user intervention, transition to the next media item may not occur until after the current media item (e.g., current media item 254 shown in FIG. 2B) completes playback. It is noted also that the selection of a next media item occurs as part of each state query, and the selection may conceivably change from one state evaluation to the next, where the next media item actually played ends up being the current next media item to play when the current media item completes playback. FIG. 7B illustrates a diagram depicting example timing of state queries in accordance with embodiments of the present disclosure. Referring to FIG. 7B, a single state query 752-1 is performed at or near the start of the media item playback, and zero or more user states may be returned. In this example, the second and final state query 752-N may not be initiated until a user selectable percentage of the current media item has completed playback. Subsequently, the next media item to play may be determined, and playback of the next media item may be initiated when the current media item completes playback. FIGs. 8A and 8B illustrate a timing diagram 800 of network communications in accordance with embodiments of the present disclosure. Referring to FIG. 8A, the computing devices 50-1, 50-2, and 50-N may each communicate a registration message 802 to register with and log in to the central system 100. In an example, the user may log into the central system 100 using account credentials from a user account such as Facebook Connect. Subsequently, as each computing device plays a media item, information identifying the currently playing media item and upcoming media items may be transmitted to the central system 100 via a suitable communication message 804. The central system 100 may maintain data indicating the devices currently playing each media item known to the central system 100, a list of media items played, the currently playing media item, and upcoming media items for each computing device 50 known to the central system 100. Information may be obtained 808 that identifies one or more media items from one or more other computing devices. The central system 100 may subsequently determine, for each computing device 50-1, 50-2, and 50-N, other devices currently playing the same media item 806. Subsequently, the central system 100 may communicate to each computing device 50, information identifying one or more media items from one or more other computing devices. With the obtained information, the computing devices 50 may each render a timeline with positions of user and other computing device playback positions 810 in accordance with embodiments of the present disclosure. For example, a position scrollbar may be updated to show playheads that indicate playback positions and that identify other computing devices currently playing the same media item. Subsequently, each computing device may select a next song for playback from among the songs currently being played by the other computing devices at step 812. The process may subsequently start over and the computing devices may provide updated current media item and playback position information for the current user 814. FIG. 9 illustrates a flowchart of an example method 900 of selecting a next media item in accordance with embodiments of the present disclosure. The method of FIG. 9 may be implemented within any suitable computing device such as one of the computing devices 50 and/or the central system 100. Referring to FIG. 9, the method 900 may include obtaining one or more identifiers of upcoming media items for playback by one or more other users of a current media item (step 902). The media item may currently be played by the computing device. The method 900 may also include selecting for playback one or more upcoming media items from a group of upcoming media items (step 904). These steps may be implemented in accordance with any of the examples disclosed herein. example, referring to FIG. 5A, the display shows playheads 520-1, 520-2, 520-3, and 520 -4 in respective positions along the scrollbar 532. In addition, the playheads may indicate media item schedules, play state, and the like for the corresponding users. Now returning to step 1006, the method may subsequently proceed to step 1008 wherein the computing device provides the media item schedule identifying a current playing reference media item and future media items to be played, in one implementation, this information is provided to a central system or server. In another implementation, this information is provided to another module of the same computing device, An example implementation of this step is provided in the method of FIG. 11 described below, At step 1010, a response is received identifying one or more media item schedules from one or more optimal other computing devices currently playing the same reference media item. In one implementation, this information can be obtained from a central system or server. In another implementation, this information is obtained from another module of the same computing device. As further illustration, this information may be received in accordance with the example method of FIG, 11. Also, next media items for the current user may be obtained. The method may then proceed to step 1012. At step 1012, playheads can be displayed for users and corresponding associated media item schedules for those with changes in position, Subsequently, the method may proceed to step 1002 to wait for another signal. As further clarification, it is noted that computing devices participating within the present system can be either contributing users or following users. Contributing users are those users who are playing content from a media source that is user-determined as opposed to obtained from the present recommendation system, Following users are those users who are playing back a stream of media items selected by the present system, in terms of FIG, 10, this can mean that a computing device will either be providing next media items to play in step 1008 or obtaining next media items to play in step 1010, but not both. FIG. 11 illustrates a flowchart of an example method 1100 of determining a list of playheads for representing other users in accordance with embodiments of the present disclosure. The example method may be implemented by a central system or any suitable computing device. In an example, the central system may be a server. Referring to FIG. 11, a server may obtain user account information identifying a user (step 1102). The server may receive the information from a computing device currently playing a media item, such as music. The server may determine whether a play history instance for the media item has been recorded. In response to determining that the play history instance for the media item has not previously been recorded, a play history instance for the media item may be recorded or added (step 1104). In response to determining that the play history instance for the media has been recorded, the play history instance may be updated in accordance with examples described herein. The method may also include marking the media item for a recommendation update if needed. The method of FIG. 11 includes obtaining a list of other users currently consuming or playing the same media item (step 1106). For example, other computing devices may transmit to the server identification of the media item currently being played by the respective computing device. The server may determine the computing devices playing the same media item. The method of FIG. 11 includes determining a number of playheads to fit on a position scrollbar and dividing the position scrollbar into intervals (step 1108). For example, the number of playheads to be identified is determined by determining the number of playhead icons that can fit on the time line of the scrollbar without touching, and subtracting one for the current user. If some white space is desired between the playheads, the number may be further reduced. The position scrollbar may then be divided into intervals. For each interval, other than the interval occupied by the current user, the optimal playhead is determined. The criteria for determining the optimal playhead may depend on one or more factors such as, but not limited to, a social distance, a social graph, subnet proximity, physical location proximity, group affiliations, media preference similarities, media collection similarities, physical location, heavy influencer status, and the like. The method of FIG. 11 also includes selecting playheads for each interval based on playhead score except for the interval containing the current user's playhead (step 1110). Further, the method of FIG. 11 includes assembling the list of playheads, corresponding positions, and corresponding media item schedules (step 1112). Further, the method includes obtaining future media items for a user, replacing the existing schedule with updated information in the media item schedule, and determining whether recommendations need to be refreshed (step 1114). The method of FIG. 11 also includes providing a list of playheads, corresponding positions, and corresponding media item schedules to the computing device (step 1116). For example, the server may provide this information to the computing device for processing and display on its display in accordance with examples described herein. In one or more embodiments, a friends list may be obtained externally through a social network site. The relationship with the friends may be a symmetrical reciprocal friendship, or it may be an asymmetrical follower/followee type relationship. The friends list may be stored on the user's computing device and/or remotely at a central system or one or more other computing devices. As an example, Table 1 sets forth a number of factors that may be used in determining other users' playheads to display on a current song position scrollbar, such as 532 shown in FIG. 5. It is noted that due to display size constraint, users (all other users for example) other than those identified on the position scrollbar may be identified in any suitable manner. It may be beneficial to consider other users when selecting a next media item. In an embodiment of the present disclosure, the final selection of which other users to render on the position scrollbar may be delayed until a next media item to play is determined, because it may then be possible to make sure that the other user(s) contributing the next media item 255 to play will be included in the other users rendered on the current song position scrollbar 532.
location information may not be available. since they are not determining their upcoming media item selections. Position trailing them, or to weight them equally. The other users and their corresponding playheads (e.g., playheads 520-1, 520- 2, and 520-4 shown in FIG. 5) may be selected from the group of all users currently playing back the same media item. Based on the current popularity of the media item, the number of other users playing back the same media item may be zero, or may be very large. 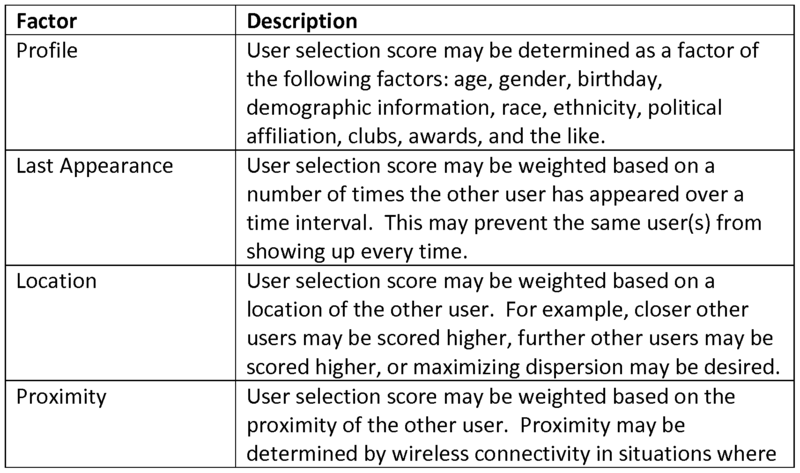 In a case in which the group of candidate other users is large, the group may be selected by assigning members of the group a score that is computed as a function of factors such as, but not limited to: social distance, profile matching, user proximity, playback position relative to user, and/or the like. In an example, other users may be excluded from the display group if they are listening to a source of content where they do not control the next media items being played. Examples of this scenario may be when the user is listening to an algorithmically generated, or "hand constructed" constructed playlist. Other examples may be cases in which the user is receiving content from a stream or broadcast source, as again, they are not controlling the next media items being chosen for playback. FIG. 12 illustrates a flowchart of an example method 1200 of determining a playhead for an interval of a scrollbar in accordance with embodiments of the present disclosure. The method may be implemented by any suitable computing devices, such as the computing devices described herein. A processor and memory may be used for implementing the steps of the method 1200. Referring to FIG. 12, the method includes playing a media item (step 1202). For example, the computing device 50-1 shown in FIG. 1 may play music or another media item. The method of FIG. 12 further includes determining a plurality of intervals for displaying playheads corresponding to other computing devices currently playing the same media item (step 1204). Continuing the aforementioned example, the computing device 50-1 may query the central system 100 for information about other computing devices playing the same media item. The central system 100 may determine the computing devices playing the same media item in accordance with examples disclosed herein. Further, the central system 100 may transmit identifiers of the computing devices to the computing device 50-1. As an example, the other computing devices may be playing the media item at a point behind or ahead of the computing device 50-1. Further, the other computing devices may be selected based on locations of the other computing devices, proximity of the other computing devices to the computing device 50-1, a social distance between a user of the computing device 50-1 and users of the other computing devices, a match of user profiles between a user of the computing device 50-1 and users of the other computing devices, the like, and combinations thereof. The method of FIG. 12 further includes selecting an optimal other computing device for at least one of the plurality of intervals (step 1206). For example, for each interval other than the interval occupied by the current user, the optimal playhead is determined. The criteria for determining the optimal playhead may depend on one or more factors such as, but not limited to, a social distance, a social graph, subnet proximity, physical location proximity, group affiliations, media preference similarities, media collection similarities, physical location, heavy influencer status, the like, or combinations thereof. The method of FIG. 12 further includes displaying a playhead corresponding to the optimal other user on the playhead scrollbar (step 1208). As an example, other playheads may also be displayed on a scrollbar in accordance with examples disclosed herein. A position of each playhead may indicate a play state of the media item on a respective computing device. Further, each playhead may indicate a location of a respective computing device, a proximity of a respective computing device, a social distance of a respective computing device, the like, or combinations thereof. FIG. 13 illustrates a flowchart of an example method 1300 of executing a thread to update all pending recommendations in accordance with embodiments of the present disclosure. Any suitable computing device, such as one of the computing devices disclosed herein, may implement the example method. Referring to FIG. 13, execution may begin with the thread waking (step 1302). I n an example, the thread may wake as a result of a media item being added to a job queue. Subsequently, a job may be obtained from the queue (step 1304). In an example, the job may be a reference to a tracker item (such as tracker item 410 shown in FIG. 4A) that requires recommendation updates. Subsequently, recommendations for the media item may be updated (step 1306). For example, the tracker item may be handled as described in the examples provided herein. At step 1308, the method includes determining whether another job is in the queue. In response to determining that another job is in the queue, the method proceeds to step 1304 to obtain the next job, and to process the job in step 1306. I n response to determining that another job is not in the queue, the method includes putting the thread to sleep (step 1310) until another job is added and the thread is again woken at step 1302. FIG. 14 illustrates a flowchart of an example method 1400 of maintaining a list of media item recommendations in accordance with embodiments of the present disclosure. Any suitable computing devices, such as the computing devices described herein, may implement the method. A processor and memory may be used for implementing the steps of the method 1400. The media item recommendations may indicate candidate media items. corresponding to the media item identifier was played (step 1402). For example, the central system 100 may receive information from computing devices 50-1, 50-2, and 50-3 that indicates media items that are currently playing or have been played. Further, the central server 100 may receive information from computing devices 50-1, 50-2, and 50-3 that indicate timestamp information such as when media items were played. The method of FIG. 14 further includes associating the play history instance to an existing play history list for the media item corresponding to the media item identifier (step 1404). The method of FIG. 14 further includes updating the list of media item recommendations by executing an evaluation function 463 in response to determining that an evaluation criteria 461 has be satisfied (step 1406). In one embodiment, the evaluation criteria 461 is satisfied by comparing the last evaluation 462 time to the play history instance timestamp and determining that a time difference between the timestamp and the last evaluation time meets a threshold. FIG. 15 illustrates a flowchart of an example method 1500 of updating recommendations for a media item in accordance with embodiments of the present disclosure. Any suitable computing device, such as one of the computing devices disclosed herein, may implement the example method. Referring to FIG. 15, the method includes determining a range of play history instances to consider for a media item (step 1502). For example, referring to FIG. 4B, the range of play history instances 450 to consider may be determined. I n another example, the play histories considered are all of the play history instances accumulated since the last update of recommendations. I n another example, the number of play history instances considered is a fixed number. The play history instances considered may come entirely from newly accumulated play history instances or they may be a combination of new play history instances and previously considered play history instances. The method of FIG. 15 further includes removing any unwanted play history instances (step 1504). The play history instances may be removed for any suitable reason. In an example, all play history instances contributed by users outside a geographic region may be removed from consideration. recommendations may be sorted, and the top scoring media item recommendations may be stored in the recommendation list for updating the recommendation list (step 1508). Subsequently, the last evaluation time is set to the current time and the reset interval usage count is reset (step 1510). Table 2 shows various factors that may be used for determining a media item selection score. FIG. 16 illustrates a flowchart of an example method 1600 of generating media item recommendations in accordance with embodiments of the present disclosure. Any suitable computing devices, such as the computing devices described herein, may implement the method. A processor and memory may be used for implementing the steps of the method 1600. Referring to FIG. 16, the method includes obtaining play schedules associated with a plurality of other computing devices, the other computing devices currently playing or having recently played a reference media item (step 1602). For example, referring to FIG. 1, the computing device 50-1 may receive play schedules from the central system 100. In an example, the computing device 50-1 may transmit to the central system 100 an identifier of a media item that it is currently playing. In response to receipt of the media item identifier, the central system 100 may determine other computing devices (e.g., computing devices 50-2 and 50-3) that are playing or have recently played the same media item as computing device 50-1. In an example, the candidate media items may be selected from among media items previously played by the other computing device(s). In another example, the candidate media items may be selected from among media items currently being played or scheduled for play by the other computing device(s) (step 1604). As an example, identifiers of the candidate media items may be transmitted to the central system 100 by the other computing devices 50-2 and 50-3. In one embodiment of the present disclosure, the candidate media items are chosen from the play schedules based on their occurring within an analysis window. The analysis window may be expressed in terms of media items or in units of time. The term "recently played media item" may refer to a media item that has been played within a predetermined time period of a current time. In another example, the term "recently played" may correspond to the media item being played within a predetermined number of previously played media items. schedules(s) may be selected based on an affinity between the user of the corresponding computing device 50-1 and users of other computing devices, such as computing devices 50-2 and 50-3. For example, the computing devices may be selected based on one or more of an influence rating, a last appearance, a location, proximity, a media source, a relative playback position, and the like. The method of FIG. 16 further includes determining recommendation scores for the candidate media item based on occurrence counts of the media items within a predetermined time period (step 1606). For example, a computing device or server may count the number of occurrences (e.g., number of times the candidate music was played) within a predetermined time period. The recommendation score may be based on the occurrence count for the others within the predetermined time period. recommendation for the other computing device based on the recommendation scores (step 1608). For example, the computing device or server may select one or more media item recommendations from the media items based on the recommendation score. For example, the computing device or server may present a media item recommendation indicating the media item with the highest number of occurrences within a predetermined analysis window. associated with the media item recommendation. For example, the computing device 50-1 may play back the media item indicated by the media item recommendation in response to receipt of the media item recommendation. In another example, the computing device 50-1 may place an identifier of the media item on a playback list for subsequent playback. FIG. 17 illustrates a flowchart of an example method 1700 of determining recommendation scores for media items in accordance with embodiments of the present disclosure. Any suitable computing devices, such as the computing devices described herein, may implement the method. A processor and memory may be used for implementing the steps of the method 1700. Referring to FIG. 17, the method includes obtaining information identifying a plurality of other computing devices recently having played the same media item as a target computing device (step 1702). The method of FIG. 17 further includes determining a recommendation score as a function of social distance and list distance (step 1704). In one implementation of the present disclosure, the formula shown in Equation 2 is used to compute the recommendation score (such as the final score 1814 shown in FIGs. 18A and 18B). The social distance SD 1808 (shown in FIGs. 18A and 18B for example) is the number of hops between friends in a social graph. For example the social distance between friends is one. For a friend of a friend, the social distance is two. The list distance LS 1806 is the distance between the recently played media item and the candidate media item being scored. I n the example calculation of FIGs. 18A and 18B, the candidate media items 1802 are labeled media item A-X. The recently played media item 1818 is media item G.
recommendation score. In one implementation of the present disclosure, the no repeat factor is accounted for by removing a media item played during a no repeat window 605 (shown in FIG. 6B). In the example of FIGs. 18A and 18B, the media items occurring within the no repeat window are media items D,F,J,M,0,R. The method of FIG. 17 further includes selecting as a recommendation the candidate media item as a function of the recommendation score of the candidate media items (step 1708). FIGs. 18A and 18B set forth exemplary computation of recommendation scores according to embodiments of the present disclosure. Media item 1802 indicates the candidate media items being scored. Contributor 1804 indicates the user of the computing device from which the respective candidate media item was obtained from a play schedule, List distance 1806 indicates the number of media items between the respective candidate media item and the reference media item 1818 in the play schedule for the corresponding contributing user. Social distance 1808 indicates the respective social graph distance between the user contributing the candidate media item and the reference media item 1818. No repeat. 1810 indicates if the candidate media item should be removed from consideration because it has been recently played by the user receiving the media recommendations, In this case., the receiving user has recently- played media items "O", " 'y' 'V'D'y y'R" so they are removed from consideration 1816. Sub score 1812 indicates the respective score contribution for each play instance occurrence considered in the computation, Final score 1814 indicates the total recommendation score for the respective candidate media item. The highest scoring candidate media item 1820 is media item "H" having a recommendation score of 1.58. The example systems, methods, and computing devices disclosed herein are described as being applied to media content such as video and music, although it should be understood that these systems, methods, and computing devices disclosed herein may be similarly applied to other media content. For example, the media content may be an electronic book (often referred to as an "e-book"). Progress of a reader of e-books on multiple computing devices may be determined as described herein and this information used among the computing devices in accordance with embodiments disclosed herein. BLUETOOTH*, or the like. The user interface component(s) 1910 may include, for example, a touchscreen, a display, one or more user input components (e.g., a keypad), a speaker, or the like, or any combination thereof. The storage device(s) 1912 may be a non-volatile memory. FIG. 20 illustrates a block diagram of a central system 100 of FIG. 1 in accordance with embodiments of the present disclosure. Referring to FIG. 20, the central system 100 includes a controller 2006 communicatively connected to a memory 2004, one or more secondary storage devices 2012, and one or more communications interface(s) 2008 by a bus 2002 or similar mechanism. The controller 2006 may be, for example, a microprocessor, digital ASIC, Field Programmable Gate Array FPGA, or the like. In an example, the controller 2006 is a microprocessor, and the control system 102 is implemented in software and stored in the memory 2004 for execution by the controller 2006. Further, user accounts and tracker information may be stored in the secondary storage device(s) 2012. The secondary storage devices 2012 may be digital data storage devices such as, for example, one or more hard disk drives. The communications interface(s) 2008 may be wired or wireless communication interfaces that communicatively couple the central system 100 to the network, such as the network shown in FIG. 1. For example, the communications interface(s) 2008 may be Ethernet interfaces, local wireless interfaces such as wireless interfaces operating according to one of the suite of IEEE 802.11 standards, or the like. Those skilled in the art will recognize improvements and modifications to the embodiments of the present disclosure. All such improvements and modifications are considered within the scope of the concepts disclosed herein and the claims that follow. The proposed system overcomes deficiencies of existing systems by making use of real time play history data provided by a number of users experiencing media items on an ongoing basis. By counting co-occurrences of media items within user play schedules, the present system is able to quickly adapt to changes in polarity of new media items. Also, since each play history instance includes geographic location information and a timestamp, recommendations may be tailored to a specific location, or to a specific time period in history. For example, the play history instance may include information about the affinity between two songs in L.A. in 1981. Additionally, since play histories are maintained per media item, it is possible to re-compute recommendation information for more popular media items on a more frequent schedule. For example, if a certain song is only played twice in a day, and another new song is played 200K times in a day, more computational resources should be applied to the more frequently played song. communicate with a computer system. However, the program(s) can be implemented in assembly or machine language, if desired. In any case, the language may be a compiled or interpreted language, and combined with hardware implementations. The described methods and apparatus may also be embodied in the form of program code that is transmitted over some transmission medium, such as over electrical wiring or cabling, through fiber optics, or via any other form of transmission, wherein, when the program code is received and loaded into and executed by a machine, such as an EPROM, a gate array, a programmable logic device (PLD), a client computer, a video recorder or the like, the machine becomes an apparatus for practicing the presently disclosed subject matter. When implemented on a general-purpose processor, the program code combines with the processor to provide a unique apparatus that operates to perform the processing of the presently disclosed subject matter. Features from one embodiment or aspect may be combined with features from any other embodiment or aspect in any appropriate combination. For example, any individual or collective features of method aspects or embodiments may be applied to apparatus, system, product, or component aspects of embodiments and vice versa. embodiments should not be limited to any single embodiment, but rather should be construed in breadth and scope in accordance with the appended claims. generating a media item recommendation for the reference media item based on the recommendation scores. 2. The method of claim 1, wherein at least one play schedule is comprised of recently played media items by a corresponding other computing device. 3. The method of claim 1, wherein at least one play schedule is comprised of a currently playing media item by a corresponding other computing device. 4. The method of claim 1, wherein at least one play schedule is comprised of media items scheduled for future playback by a corresponding other computing device. 5. The method of claim 1, wherein all of the media items are one of audio, video, and text. 6. The method of claim 1, wherein the recommendation scores are based on the candidate media items occurring within an analysis window. 7. The method of claim 6, wherein the analysis window includes candidate media items occurring after a currently playing media item. 8. The method of claim 6, wherein the analysis window includes candidate media items occurring before a currently playing media item. 9. The method of claim 6, wherein the analysis window duration is measured in units of time. 10. The method of claim 9, wherein the analysis window duration is determined as a function of the duration of a currently playing media item. 11. The method of claim 9, wherein the analysis window duration is determined as a function of a media type of media items in the play schedules. 12. The method of claim 6, wherein the analysis window is measured in units of media items. 13. The method of claim 1, wherein the media item recommendation indicates a media item corresponding to one of the candidate media items. 14. The method of claim 1, wherein the media item recommendation is provided to another computing device currently playing the reference media item for future playback. 15. The method of claim 14, further comprising using the computing device to play back the media item associated with the media item recommendation. 16. The method of claim 15, further comprising using the computing device to play back the media item associated with the media item recommendation in response to receiving the media item recommendation. 17. The method of claim 1, wherein recently played corresponds to the reference media item being played within a predetermined time period of a current time. 18. The method of claim 1, wherein recently played corresponds to the reference media item being played within a predetermined number of previously played media items. 19. The method of claim 1, further comprising selecting the play schedules based on a profile match between a profile of a user of a target device and profiles of users of the other computing devices. 20. The method of claim 19, wherein the user profile is comprised of items selected from the group consisting of: influence rating, last appearance, geographic location, geographic proximity, media source, and relative playback position. 21. The method of claim 1, wherein the computing device is a server. 22. The method of claim 1, wherein the reference media item is the media item currently being played by the computing device requesting the media item recommendation. selecting for playback one or more of the one or more upcoming media items. generate a media item recommendation for the reference media item based on the recommendation scores. computer readable program code configured to generate a media item recommendation for the reference media item based on the recommendation scores. displaying a playhead corresponding to the optimal other computing device on the playhead scrollbar. 27. The method of claim 26, wherein the media item includes one of music, video, and text. 28. The method of claim 26, wherein one or more of the playheads corresponding to the other computing devices represents the other computing devices currently playing the media item at a position behind the computing device. 29. The method of claim 26, wherein one or more of the playheads corresponding to the other computing devices represents the other computing devices currently playing the media item at a position ahead of the computing device. 30. The method of claim 26, wherein the optimal other computing device is selected based on its geographical location. 31. The method of claim 26, wherein the optimal other computing device is selected based on its geographical proximity to the computing device. 32. The method of claim 26, wherein the optimal other computing device is selected based on a social distance between a user of the computing device and a user of the optimal other computing device. 33. The method of claim 26, wherein the optimal other computing device is selected based on a profile match between a user of the computing device and a user of a corresponding other computing device. 34. The method of claim 26, wherein the optimal other computing device is selected based on a user preference of a user of the computing device. 35. The method of claim 26, wherein at least one playhead comprises information graphically indicating a play state of the media item on a corresponding other computing device. 36. The method of claim 26, wherein at least one playhead comprises information graphically indicating a location of a corresponding other computing device. 37. The method of claim 26, wherein at least one playhead comprises information graphically indicating a proximity of the computing device to a corresponding other computing device. 38. The method of claim 26, wherein at least one playhead comprises information graphically indicating a social distance of a user of a corresponding other computing device. 39. The method of claim 26, wherein at least one playhead comprises information graphically indicating an influence rating of a user of a corresponding other computing device. 40. The method of claim 26, wherein at least one playhead comprises information graphically indicating a gender of a user of a corresponding other computing device. 41. The method of claim 26, wherein at least one playhead comprises information graphically indicating a last appearance of a corresponding other computing device. 42. The method of claim 26, wherein at least one playhead comprises information graphically indicating a media source of the media item played by a corresponding other computing device. 43. The method of claim 26, wherein at least one playhead comprises information graphically indicating a nationality of a user of a corresponding other computing device. 44. The method of claim 26, wherein at least one playhead comprises information graphically indicating a group affiliation of a user of a corresponding other computing device. 45. The method of claim 26, wherein at least one playhead comprises information graphically indicating a recently played media item of a corresponding other computing device. 46. The method of claim 26, wherein at least one playhead comprises information graphically indicating an upcoming media item of a corresponding other computing device. 47. The method of claim 26, wherein at least playhead comprises information graphically indicating a favorite artist of a user of a corresponding other computing device. 48. The method of claim 26, wherein at least one playhead comprises information graphically indicating a favorite media item of a user of a corresponding other computing device. 49. The method of claim 26, wherein at least one playhead is displayed on the playback scrollbar on a display of the computing device. select an other computing device for at least one of the plurality of intervals; and display a playhead corresponding to the selected other computing device. computer readable program code configured to display a playhead corresponding to the selected other computing device. in response to determining that the update criteria has been satisfied, updating the list of media item recommendations. 53. The method of claim 52, wherein updating of the list of media item recommendations is performed by the update function. 54. The method of claim 53, wherein the update criteria is determined as a function of elapsed time since the last update was performed. 55. The method of claim 53, wherein the update criteria is determined as a function of play history instances received since the last update was performed. 56. The method of claim 53, wherein the update criteria is determined as a function of a number of media item recommendation requests since the last update was performed. 57. The method of claim 53, wherein the update criteria is determined as a function of a number of times the media item has been played since the last update was performed. 58. The method of claim 52, further comprising determining the media item recommendations based on recommendation scores for the media items in the play history. 59. The method of claim 58, wherein the recommendation scores are determined as a function of one or more of: time of play of a media item, media content blocking information, evaluation time, usage count, and a number of times media content has been accessed. in response to determining that the removal criteria has been satisfied, removing a play history instance from the play history list. 61. The method of claim 60, wherein removing a play history instance from the play history is performed by the removal function. 62. The method of claim 60, wherein the removal criteria is determined as a function of a total number of play instance histories in the play history list. 63. The method of claim 60, wherein the removal criteria is determined as a function of an influence rating of a user in the play history instance. 64. The method of claim 60, wherein the removal criteria is determined as a function of a geographic location of a user in the play history instance. 65. The method of claim 60, wherein the removal criteria is determined as a function of a friend count of a user in the play history instance. 66. The method of claim 60, wherein the removal criteria is determined as a function of an online status history of a user in the play history instance. 67. The method of claim 52, wherein the media item includes one of audio, video, and text. 68. The method of claim 52, wherein the media item recommendations indicate candidate media items. 69. The method of claim 52, wherein the play instance history is obtained based on a percentage of the media item having been consumed. 70. The method of claim 52, wherein the play instance history is obtained based on a percentage of the media item having yet to be consumed. 71. The method of claim 52, wherein the play instance history is obtained based on a time duration of the media item having been consumed. 72. The method of claim 52, wherein the play instance history is obtained based on a time duration of the media item having yet to be consumed. playing back the media item corresponding to the media item identifier. 74. The method of claim 52, further comprising providing the media item recommendations to a computing device. computer readable program code configured to update the list of media item recommendations in response to determining that the update criteria has been satisfied. MX2007005981A (en) 2004-11-19 2007-07-04 Nielsen Media Res Inc Method for detecting space-shifted media. BRPI0714273A2 (en) 2006-08-07 2014-10-29 Chacha Search Inc "Method for providing a search party of interest, storage media that can be read by computer, search engine information to provide the search information to provide the search of the interest group run by human searchers, storage media that can be read by computer to control to control a computer that includes a record of the interest group, storage media that can be read by computer to control a computer that includes a searcher record interest group, storage media that can be read computer to control a computer that includes a record of the authorization of the interest group and interface "